Queen's wide receiver Scott Valberg is out to wash away the stain, as the school song goes. A source has confirmed the all-Canadian wideout, who is attending teacher's college in the fall, won his appeal to have a year of eligibility restored. As a frosh in 2004, Valberg played in Queen's opener vs. Windsor. He dressed for the second game vs. Guelph, got in for about four plays and suffered a serious muscle pull which knocked him out for the rest of the season. As is my understanding, the eligibility people are pretty forgiving if a football player participated in only one game. Because Valberg suited up a second time that season, it was less clear-cut. Needless to say, this should be welcome news in Kingston. Valberg led the country in yards (1,013) and touchdown catches (11) last fall and provides ton of experience in the receiving corps. 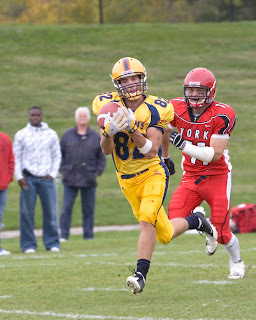 Queen's already has inside-receiver position to fill, since tight end Scott Stinson graduated. They also lost an all-Canadian on each side of the ball to the CFL, with tailback Mike Giffin and defensive tackle Dee Sterling respectively moving up to Montreal and Edmonton. A big question — besides who's going to be the feature back — surrounding the Golden Gaels six weeks out from the season opener is who else might be returning to a team which went 8-0 in the regular season before suffering a bitter defeat to Ottawa in the OUA semi-final. The door is open to all-Canadian defensive end Osie Ukwuoma coming back from the Calgary Stampeders. He has not dressed yet, so it is more than likely he will be back in the Tricolour. Presidents' Trophy-winning inside linebacker Thaine Carter dinged up his shoulder at Winnipeg's camp, so his status might not be known until some time in August. There could be a few more surprises. In the here and now, though, Valberg's return means QB Dan Brannagan has his No. 1 receiver back.